Last weekend’s fatal, self-driving car crash could make cities less likely to trust the company and undermine Uber’s claim that it’s a platform rather than a transportation service. The company has spent the better part of the past year cleaning up the mess left by former CEO Travis Kalanick, who oversaw the company’s meteoric rise and turned it in into a symbol for the ruthless, growth-at-all-costs attitude that has come to represent the dark side of Silicon Valley. Now, Uber has the ignoble distinction of being possibly the first company to be involved in a fatal crash with a self-driving vehicle. 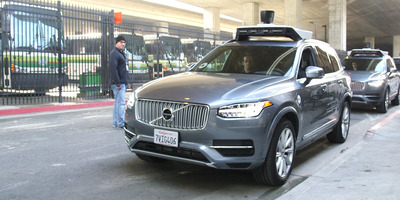 Immediately after last Sunday’s accident – in which a self-driving Volvo XC90 operated by Uber hit and killed a 49-year-old woman, Elaine Herzberg, in Tempe, Arizona – local police indicated that the accident probably wasn’t Uber’s fault. But a video released on Wednesday and showing the moments before the accident indicates otherwise. The video reveals that Herzberg likely wouldn’t have been visible to the human eye long enough for the car’s backup driver to intervene, but the sensors, radar, and LIDAR systems that detect objects near self-driving vehicles shouldn’t have had the same problem. The video could end up shaping the reputation of the company’s self-driving arm in the same way a February 2017 video of Kalanick arguing with an Uber driver defined its current business as careless and insensitive. Even if Uber can perfect its self-driving technology by mid-2019, when it hopes to launch an autonomous ride-hailing service, city governments might not trust the company enough to work with them. The effects of the accident could extend beyond Uber’s self-driving ambitions and undermine one of its fundamental claims: that it’s a platform which connects drivers and passengers, rather than a transportation service. Defining itself as a platform decreases the company’s liability for what happens to its customers, drivers, and the other vehicles they affect. While that redefinition won’t help Uber’s reputation or stock price in the short term, it could end up forcing the company to become more serious about safety, which could save the company in the long run. “I think the positive thing that will come out of this is Uber is going to invest a lot more in the safety of its riders,” Rahmani said. That process would be painful, but it could end up being the reason the company doesn’t become a victim of its recklessness.